When LDL cholesterol undergoes oxidation, it increases the chances that there will be damage to the arteries and heart. These two effects in combination can lead to heart disease. Researchers from the University of Tasmania in Australia found that when men and women were given cayenne pepper for four weeks and then compared to a control group who did not receive any cayenne pepper, the treatment group had a lowered rate of LDL cholesterol oxidation then the control group (Gamonski). The researchers believe that adding cayenne pepper to one’s diet may be a key step in eliminating heart disease. Consuming cayenne peppers has been found to help with weight loss. Research published by the Journal of Biological Chemisty found that capsaicin consumption increases thermogenesis (Gamonski). Thermogenesis is the process in which the cells convert energy into heat. As the process of thermogenesis occurs, body temperature increases as well as one’s metabolic rate which helps to reduce body weight. Cayeene pepper was also found to control blood sugar which helped with weight loss. 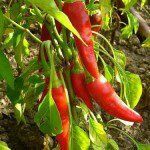 It was found that participants who consumed cayenne peppers with their lunch had a higher blood level of a sugar-regulating hormone and a lower level of ghrelin which is known as the “hunger hormone” (Woodward). Another heavily researched benefit of cayenne pepper is its ability to help reduce blood pressure. A study conducted at the Third Military Medical University in China found that when hypertensive rats consumed 6 capsules of capsaicin, there was a decrease in blood pressure compared to the control rats who did not receive the capsaicin treatment (Gamoski).These effects occurred because capsaicin led to an increased production of nitric oxide which helped to dilate and relax the blood vessels and increase blood flow. An increase in blood flow reduces blood pressure. Some people may be allergic to cayenne cream and may develop a rash as well as other symptoms of an allergic reaction when applying the cream for the first time. Cayenne cream may also cause irritations to the eyes and nose if contact occurs. The University of Maryland Medical Center found that when taken orally or in the form of cayenne supplements, stomach irritation may occur along with gastritis and heartburn if taken in excess (Terry). Because cayenne pepper increases the production of stomach acids, it can interfere with the effects of certain acid reflux medications that act as stomach aid reducers (Terry). Cayenne pepper may also increase your risk of bleeding if taking blood thinners. Research conducted by the University of Pittsburg medical center found that consuming cayenne peppers increases the ability of the body to absorb the asthma medication therophyillne which leads to toxicity from the drug (Terry). However, one positive side effect is that of the ability of cayenne to prevent stomach damage from non-steroidal anti-inflammatory agents. Celery. Medical Health Guide, 2011. Web. 28 Jun 2012. Celery. WebMd, 2009. Web. 28 Jun 2012. Ehrlich, Steven. “Celery Seed.” University of Maryland Medical Center, 02/01/2011. Web. 28 Jun 2012.